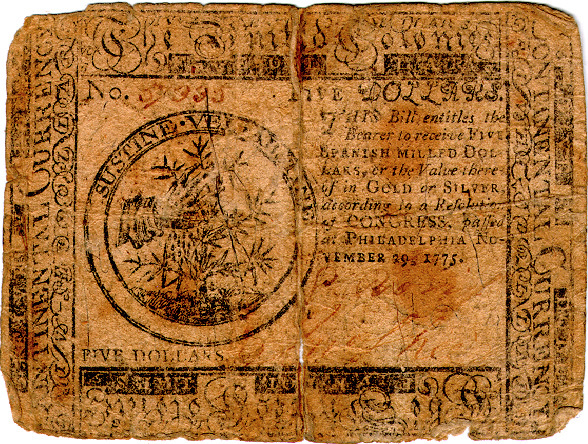 Signers: Phineas Bond, John Shee. Size: 72 x 96mm (front border design: 70 x 92mm; back border design: 67 x 88mm). 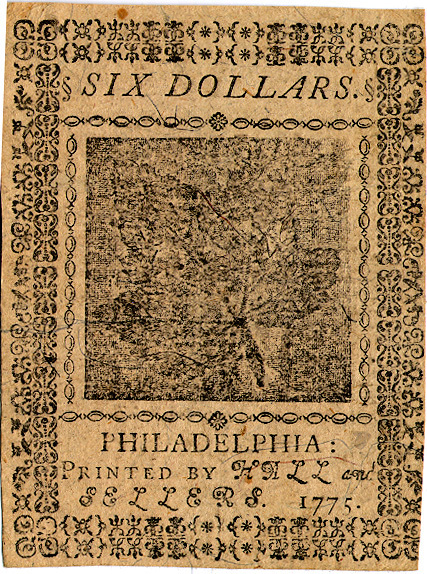 The nature print on the back is of betony and sage and is identical to to the nature print used on earlier Pennsylvania currency. Paper contains blue threads and mica flakes. The back of our example has been reinforced with small bits of glued paper. Signers: Benjamin Fuller, Joel Evans (in red ink). Size: 71 x 93mm (front border design: 70 x 91mm; back border design: 68 x 89mm). Comments: Numbering and second signature in red ink; first signature in black ink. 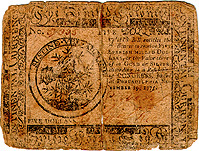 The emblem on the front shows a beaver gnawing down a tree with the motto: "Perseverando" (By persevering). The nature print on the back is of buttercup. Paper contains blue threads and mica flakes. 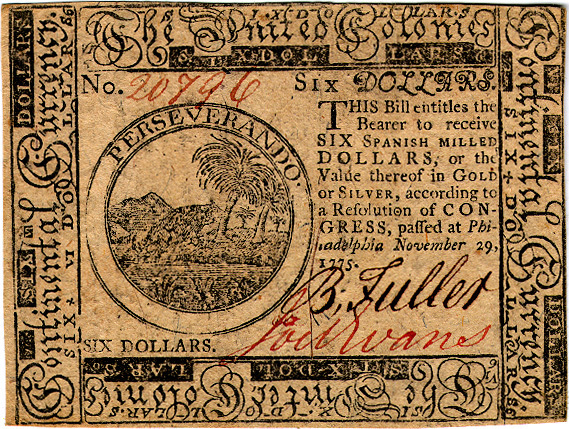 Provenance: EANA mail bid auction 1/13/96 lot 277. 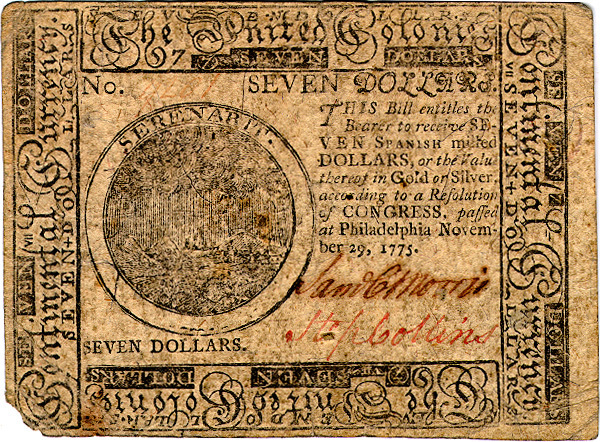 Purchased through the Robert H. Gore, Jr. Numismatic Endowment. Signers: Samuel C. Morris, Stephen Collins (in red ink). Size: 72 x 97mm (front border design: 70 x 90.5mm; back border design: 67 x 89mm). Comments: Numbering and second signature in red ink; first signature in black ink. The emblem on the front shows a storm at sea with the motto: "Serenabit" (It will clear up). The nature print on the back is of bettercup. 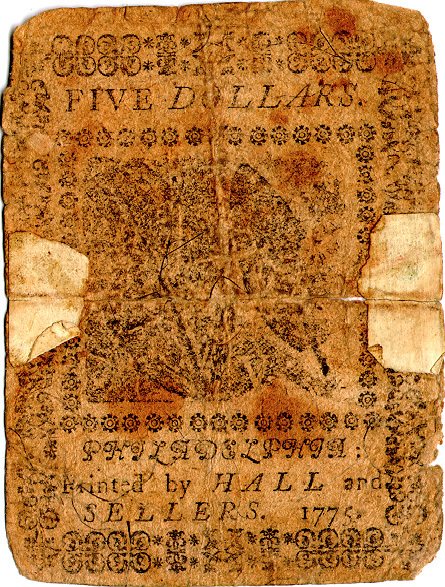 Paper contains blue threads and mica flakes. Signers: Thomas Smith (in red), William Crispin. Size: 72 x 95mm (front border design: 70 x 92mm; back border design: 70 x 90mm). Comments: Numbering and first signature in red ink; second signature in brown ink. 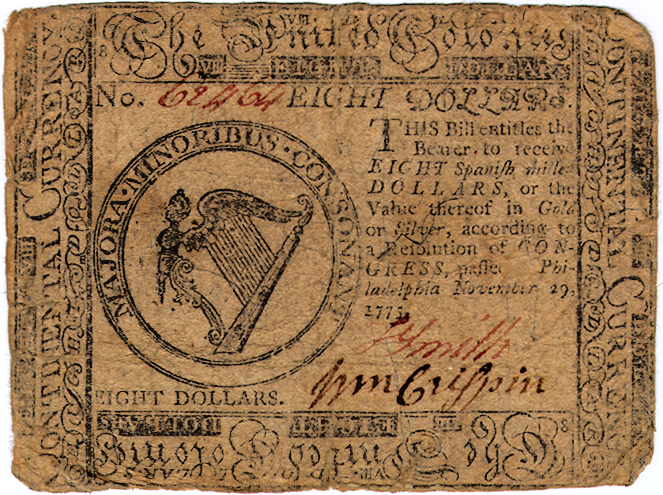 The emblem on the front (39mm) shows a harp with thirteen strings with the motto: "Majora minoribus consonant" (The larger are in harmony with the smaller). The nature print on the back is of a henebit leaf and two buttercup leaves. 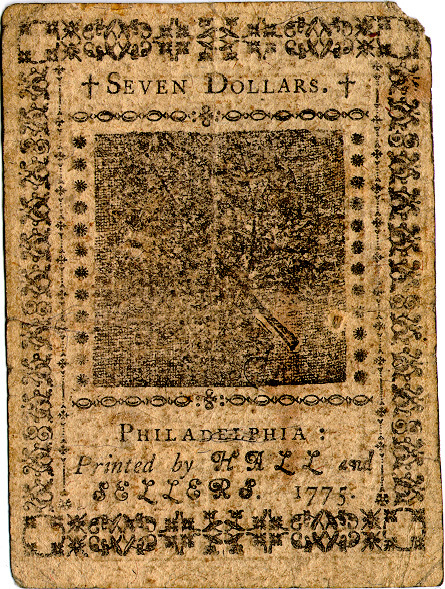 It is identical to a nature print used on earlier Pennsylvania currency. 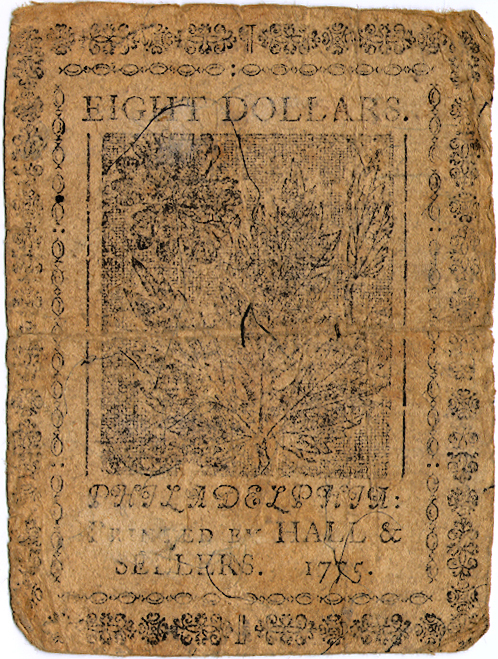 The paper contains blue threads and mica flakes.